Shane Godfrey had been away for around five weeks, recovering from a period of illness.The two have been inseparable since Shane, from Sanford in North Carolina, found Willie as a stray on his front porch. In that time, he lost more than 50lb – so much weight that he looked very different when he got back home. That’s why his dog Willie didn’t realise who it was at first, cautiously creeping forward in guard dog mode, nervous of a stranger – until he got to smelling distance. ‘He sure didn’t realise it from seeing me but all it took was one sniff,’ Shane said. But it wasn’t until Willie smelled him that he finally realised it was his best friend. In that moment, his joy is unmistakable. His tail starts wagging uncontrollably, he leaps up into Shane’s arms and licks his face, jumps and twists around and then finally grabs a toy and runs off in crazy, happy circles around the field when it all gets overwhelming. That, right there, is true love. 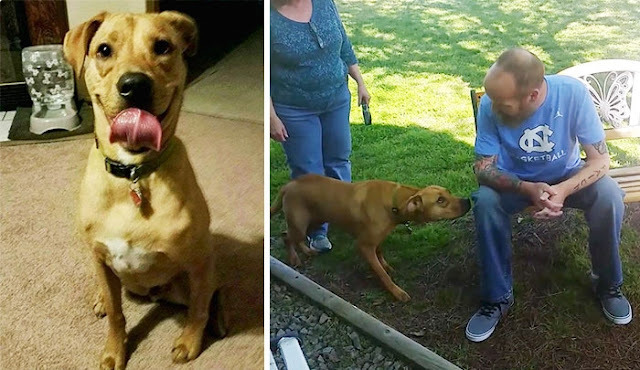 Responses to "Dog doesn’t recognise owner after he lost weight – until he sniffs him"